Congratulations to the Last Two Grant Recipients! The Ivan O. Davis - Liberty Library for their "Aging Well" program to serve senior citizens in their community. The Acton Public Library for their project "Nature Packs" to provide families with tools and resources to use on the nearby Mary Grant Nature Preserve. These are the final two grants that FoML will award as the organization is disbanding (see below). For a complete list of grants given since 1994, please see Grant Recipients. The account for our website will expire on March 19, 2018. If you would like to save any information from this site, please do so before that date. 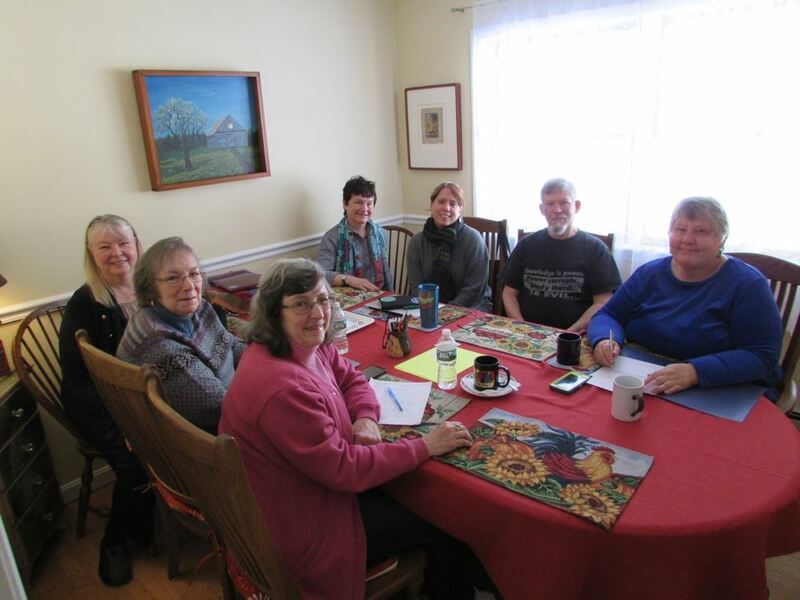 Bittersweet day on January 19, 2018 as the Executive Board of the Friends of Maine Libraries met for the last time in Brunswick to decide who will be awarded the last two FoML grants. Front row: Paulette Oboyski, Gale Briggs, and Laurel Parker. Back row: Nancy McGinnis, Nicole Rancourt, John Clark and Barb Rehmeyer. In 1992, Edith and Bill Anderson of the Witherle Library in Castine, Maine led the statewide effort to establish Friends of Maine Libraries (FoML). Many libraries had their own Friends group but there was no statewide entity to bring folks together in support of the larger library community. Bylaws were written, officers elected, and memberships enrolled. In the beginning it was mostly organizational members, then as time continued, individuals joined the group. In the 25 years that FoML has supported libraries, almost $30,000 has been raised in dues. Every year, almost all of the funds raised were given as grants to help support a wide diversity of projects. Books were purchased, new Friends groups were started, book clubs were organized, ukuleles purchased and circulated, performers made presentations, technology was upgraded and community was built. Three factors now bring about the close of the FoML era. The “check-off” initiative on the Maine State Tax Returns has raised funds to help support libraries throughout the state. Through this broad effort, many more dollars are now being shared than FoML could ever possibly generate United for Libraries, a national organization supporting Friends groups, is a wonderful resource that “brings together libraries’ voices to speak out on behalf of library services and free public access to information.” Friends groups associated with libraries are welcome to join for a reasonable fee. And now, with DigitalMaine resources available, the history of the organization may be captured and a public record of the good FoML provided during its 25 years will be available for the public to study. As the president of Friends of Maine Libraries, I am announcing our board’s unanimous decision to disband our organization. The good news: we do have $1,500 remaining in our treasury, which we intend to use for our final round of grants. FoML will be selecting two recipients to receive a $750 grant to be awarded to a library or Friends group in Maine. This grant is for special projects that enhance library service and promote stronger library-community relationships. (Sorry Applications are now closed.) All applications must be from FoML Organization members in good standing. You can check your organization’s membership status in the Directory. Applications must be received by December 31, 2017; the grant selection will be announced on February 14, 2018. My board colleagues and I would like to thank you for your participation and support of FoML over the past two and a half decades. We wish you and your library all the best in the future.